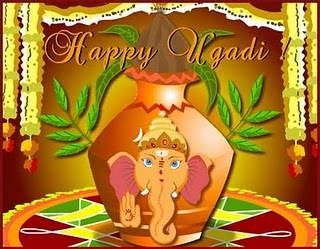 Ugadi is the beginning of the year for the people of Andhra Pradesh, Karnataka and Maharsahtra in India. This festival comes in March/April every year as the spring season arrives with trees decorating themselves with tender leaves in different colors, followed by beautiful blooms. The spring season is a symbol to the human kind that there is a hope and a reminder that we are blessed to be surrounded by beautiful nature. It is in spring that life comes back to normal after being barren for months. According to the puranas, Brahma started creation on this day, Chaitra Shudda Padyami. Ugadi is a very important festival for people of Andhra Pradesh, Karnataka and Mahrashtra. For them it is the beginning of a new year. In Andhra Pradesh and Karnataka they call the festival as "Ugadi", and in Mahrsahtra they call it as "Gudi Padwa. On this day people wake up early, take a special head bath, and decorate their entrances with mango leaves symbolizing an invitation to material and spiritual flourish in to their homes and lives. The front yards are sprinkled with the water mixed in the cow dung and they are decorated with floral designs called "rangoli". Being a sacred animal cow.s dung is considered as a natural purification agent and contact with the cow dung believed to bring blessings into one.s life. Food has a special place in all Hindu festivals. On Ugadi day rice dish is made with grated green mangoes. Different types of sweets are made as per the regional custom. One item that has a special significance on Ugadi days is "Ugadi Pacchadi"(light tamarind juice mixed with five other tastes). The six tastes used in making Ugadi Pacchadi are: sweet, bitter, tang, sour, hot, and salty. Ugadi Pacchadi signifies that life is made of different experiences like happiness, sadness, bitterness, etc. Everyone must take these experiences equally and lead a balanced life. This pacchadi is also considered as healthy at this time of the year as hot season begins. It has its medicinal significance also. In Maharashtra also people celebrate the day similarly by decorating their houses, cooking special dishes at home and offering special prayers at home and temples. It also marks the end of Rabi season, and the yield is taken to the markets. On this day people fill silver or brass pots are decorated with coconuts, mango leaves and wrapped in silk clothe and placed on a pole. This represents appreciation of nature.s bountiful gifts that were given to us by God. Mahrsahtrians make Halwa, Srikhand and Kheer on this day as special dishes to celebrate the New Year. An important component of Ugadi celebration is to go to the temple and listen to the year'ss predictions. Usually the priest or an expert in astrology gives full details of how the year will be for people of each zodiac sign, and also predictions related to politics, marriages, jobs, promotions, natural calamities, wars, rains, crops, etc. Further, experts in astrology advise people to perform certain pujas(prayer services) to minimize and eliminate the negative energy from their lives. It is strongly believed that praying to God by going to the temples and conducting prayer services at home will help to have a a peaceful and happy year for everyone. That.s why on Ugadi day all temples are packed with people. This years's Shakaya Samvatsara Vijaya & Vikrami Samvatsara Parabhava Panchanga Sravanam is here. One famous activity that is conducted on Ugadi day in Andhra Pradesh and Karnataka is "Kavi Sammelanam"(gathering of poets). In the Kavi Sammelanam poets gather and share their poetic talent. Poetry competitions are also conducted during Kavi Sammelanam. This also marks the beginning of new ventures in poetry, music and other literary areas. One ancient talent that is demonstrated by experts on this day is "Ashtavadhaanam", "Shathavadhanam" and "Sahasravadhanam". This is an amazing skill that very few people have now-a-days. Depending upon the type, a literary expert must remember tricky and grammatical sentences and verses presented to him by eight, hundred and one thousand literary experts, and recall them in the same order at the end of the program. During the process some experts pose meaningless questions that are not at all related to distract the expert. The challenges is to remember the people with the verse that he/she presented in the same order, combine all the verses grammatically and present the content to the audience in poetic form. It is like one is expected to complete a brand new puzzle within a specific time, in the correct order by listening to the most difficult clues given by experts. It is an amazing test for one.s concentration, outstanding memory and brilliance in language. Performing special prayers service(aaradhana) to the family gods, abhishekas(special bathing ceremony) at home and in the temples, reciting Sri Vishnu Sahasranaama Parayanam, Sri Lakhsmi Astothhara Parayanam and Sri Laitha Sahsaranaamam would bring peace and harmony into one.s life. Further it will help to remove any obstacles that one is likely to face during the year.